The best description of the 2018 Colorado economic forecast is steady. After adding jobs at a rate of 2.2% in both 2016 and 2017, Colorado will add jobs at a rate of 2.0% in 2018. Given all the moving pieces in an economy, that is steady! Watch for the following on Colorado’s economic front in the coming months. Colorado will benefit from stable global and U.S. real GDP growth. Net migration will be comparable to the last two years. The Colorado inflation rate will increase; it will be about a point greater than the U.S. rate. 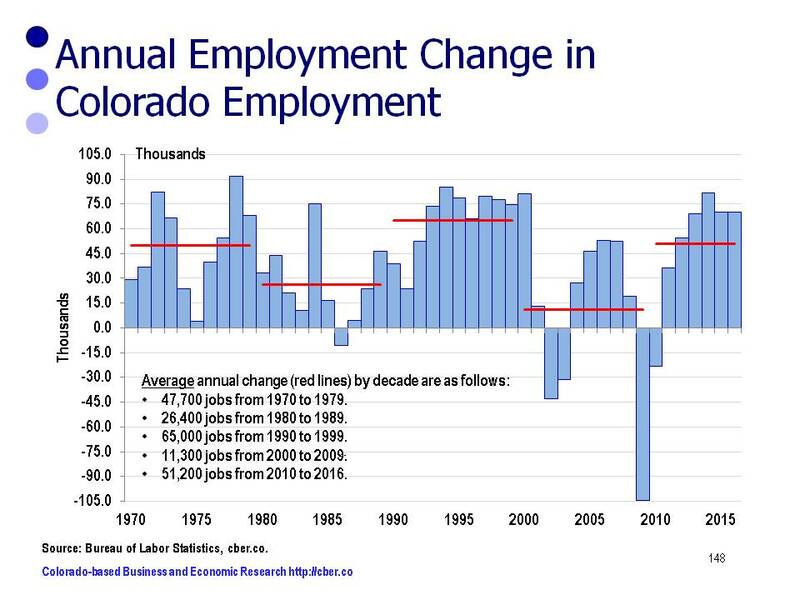 The Colorado economy is not operating efficiently because the unemployment rate is too low. The Colorado real GDP growth rate will be greater than the U.S. rate and will be driven by health care, real estate, and the extractive industries. The state’s economic growth would be slowed if the Fed Funds rate is increased 3 times in 2018. Manufacturing growth will be driven by a handful of larger companies. Retail trade is evolving. Retail sales will remain strong. The 2018 legislative session will be dicey as legislators struggle to address social issues, congestion, transportation issues, the state pension fund, and how much funding should be allocated to education. The state’s information sector is quietly evolving; there will be minimal job growth, but high value added. The growth of the state will be constrained by the lack of workers to complete construction projects. There are three economies in Colorado – Front Range, micropolitan areas such as Durango, and rural Colorado. It is an understatement to say that many rural counties are significantly challenged. Amazing things are happening at DIA and the area surrounding it – Welcome Gaylord! The lack of snow in December and early January has left its mark on the state’s ski areas. It would be worse if they had not invested in snowmaking. There will be ups and downs, but 2018 will be a good year! It will be steady! For more details about the Colorado economy check out the cber.co 2018 Colorado economic forecast on this website. In early March the Bureau of Labor Statistics released revised employment data for Colorado showing that 2014 was the 3rd strongest year of job growth in the state’s history and 2015 was ranked 9th. • The slowdown in the Chinese economy has caused many countries to experience lower rates of GDP growth. • Colorado’s extractive industries are continuing to contract. • Just as the Broncos can’t win the Super Bowl every year, it is not possible to have “Super-Bowl-like” job growth all the time. • There is solid GDP growth across most Colorado sectors. • Job growth is stable in most industries and occupations. • Solid and diverse growth will continue in the state’s personal income, population, and per capita personal income. • There is a strong outlook for the construction industry in Colorado and the U.S.
• Robust new car sales are a reflection of solid personal consumption. • There is increased activity at DIA and the area surrounding the airport. • While low unemployment can be problematic it will drive higher wages. • Higher wages will cause increased consumption and offset higher living costs. Despite the headwinds, Colorado is on track for continued solid growth in 2016. For more details check out the most recent updates by clicking here or check out cber.co Colorado Economic 2016 Forecast. This past week, the Bureau of Labor Statistics (BLS) announced that Colorado job growth for 2014 was revised upwards to 83,000 and 2015 job growth was bumped up to 76,300. The respective rates of Colorado job growth were 3.5% in 2014 and 3.1% in 2015. The upward benchmark revisions made 2014 the third strongest year of absolute job growth while 2015 was the ninth strongest year. This is the best news for the state since the Broncos won the Super Bowl on February 7th. 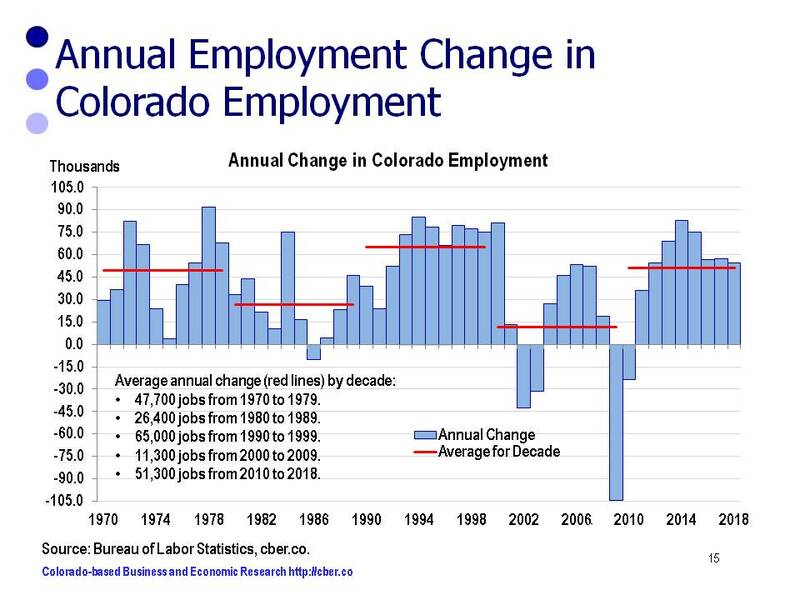 During 2014 the BLS monthly estimates reported the Colorado economy was adding jobs at a declining rate. 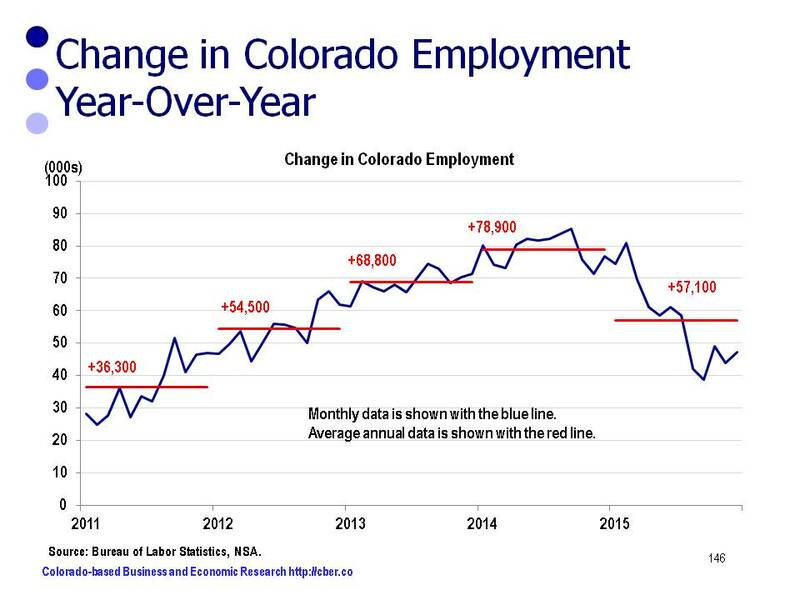 This past year, BLS showed that Colorado was adding jobs at an even faster declining rate than in 2014. Thank goodness the BLS projection models were grossly flawed. the benchmark revisions match the activity that has taken place on the streets for the past two years. These five industries accounted for 45.8% of total employment. Total employment for 2015 was 2,541,200. These five industries accounted for 60% of the jobs added. The job growth for these five industries combined was 4.1% in 2015. Job growth in 2016 will be solid, but slightly off the pace of 2015. Growth will be slowed by low oil prices, the slow economy in China, and a strong dollar abroad. 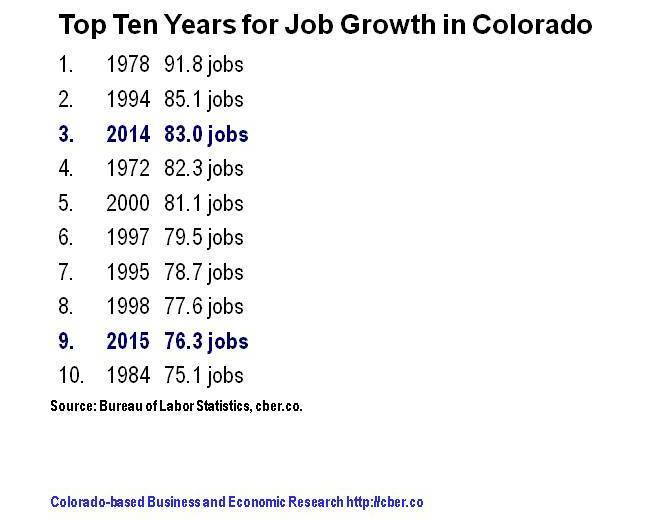 For more details check out the review of Colorado 2015 job growth by clicking here. And there is much more. For more details check out the cber.co Colorado Economic 2016 Forecast. It is official, Denver International Airport celebrated its 20th anniversary with a record setting 54 million passengers in 2015. To be exact, there were 54,014,502 passengers in 2015 up from 53,472,514 in 2014. This is an increase of 1.0% or 541,988. The record growth was made possible by solid traffic throughout the year that included a record number of passengers in April and the last four months of the year. International traffic in 2015 was flat compared to the previous year, 2,292,613 in 2015 vs. 2,208,209 in 2014. A DIA press release indicates that the use of the airport’s custom facility increased by 16%; however, Canadian preclearance flights declined 22%. The Canadian shortfall was attributed to the decreased activity in the oil and gas industry caused by lower prices for a barrel of oil. It was also a good year for cargo. DIA handled 545,784,431 pounds of cargo in 2015 compared to 519,434,240 pounds the prior year. This is an increase of 5.1%. United continued to be Denver’s airline of choice with 42.3% market share. Southwest was second with 29.8% followed by Frontier with 12.4%. The airline with animals on the tails of its planes had a disastrous year in 2015. It led the industry in complaints and the number of Frontier passengers in 2015 declined by almost 32% from the prior year. 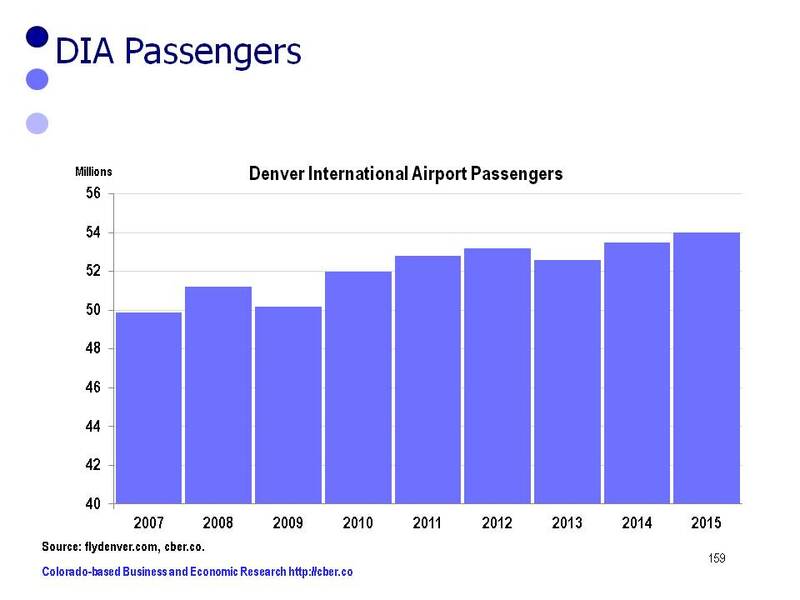 During each of the 20 years that DIA has been in operation, the airport has become more important to the Colorado economy. That will continue to be in case in the years ahead with the addition of the Westin Hotel at the end of the terminal. In addition there will be a stronger connection to downtown Denver when the light rail project between DIA and Denver is completed. Over the past 20 years businesses have sprung up around DIA. A prime example of that is the Gaylord project that is expected to open in 2-3 years. DIA has two distinctive competencies over many other airports. First, it is located in the middle of the U.S. Second, it has room to expand when growth becomes necessary. DIA is poised to be an economic engine for Colorado in 2016 and many years into the future. 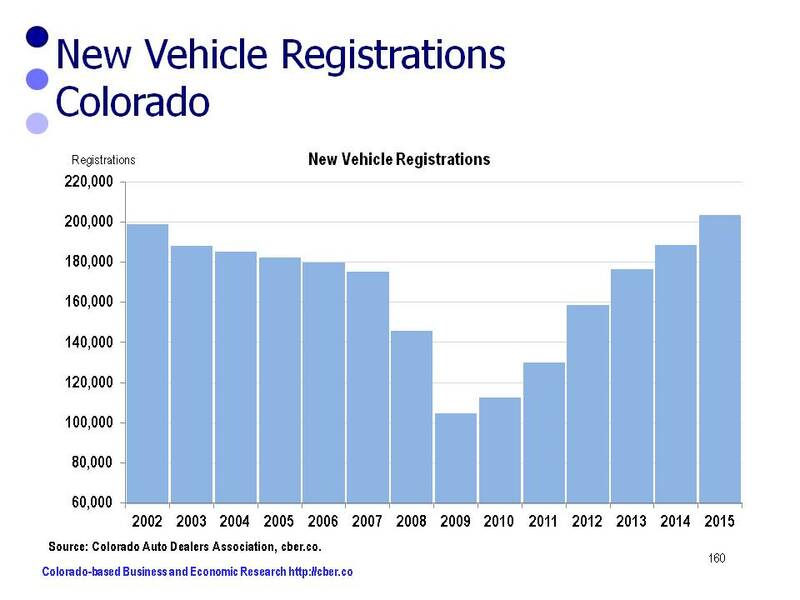 Colorado auto dealers had a banner year in 2015 reaching a record 203,471 new car registrations. This topped the previous high of 198,910 in 2002. Auto sales were driven by low gasoline prices, easy access to credit and low interest rates. In addition, Colorado experienced strong net migration and solid employment growth in 2015. After peaking in 2002, the number of new registrations gradually tapered off until 2007. At that point they plummeted to 104,687 in 2009. The number of new car registrations has almost doubled between 2009 and 2015. About 35% of the 2015 new registrations were light trucks and 65% were autos. Light truck new registrations increased by 15.3% compared to only 3.5% for cars. Almost 45% of the 2015 new registrations were for Japanese brands and 39% were for the top three Detriot brands. Slightly more than 10% were European brands and the remaining 6% were Korean brands. The new registrations for Detroit and European brands increased by almost 10%, while the Japanese brands increased by slightly more than 7.4%. There was a decline in the number of new registrations for the Korean Brands. The vehicle segments with the largest gains in market share, 2015 vs. 2014, were compact and compact luxury SUVs. The largest losers were standard mid-size cars and sub-compact cars. If the economy stays healthy, car sales will likely show record growth in new car registrations again in 2016. The source for the data in this post is the Colorado Auto Dealers Association. Despite the gloom and doom of the new year, there is reason to feel good about the U.S. job market. The news from the dark side is that oil prices are down, the equity markets are volatile, it is an election year, and there is uncertainty about the global economy….There are always headwinds. • About 10 million jobs were added in the last four years (2012 to 2015). • Weekly initial jobless claims have been below 300,000 for about a year. • The recent growth in wages exceeds the rate of inflation. • Low gasoline prices have fueled greater saving and consumption. • Job Openings – All positions that are not filled on the last business day of the month. • Hires – All additions to the payroll during the month. • Separations – all employees separated from the payroll during the months. 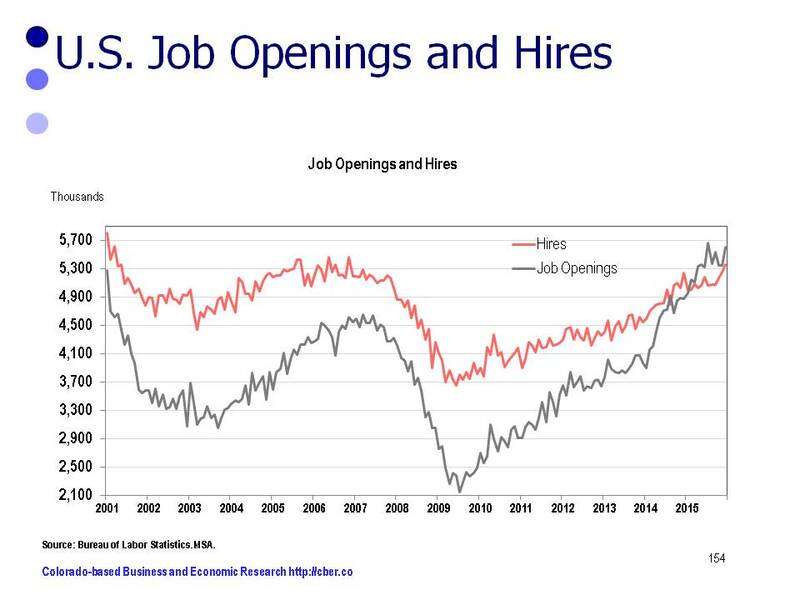 During periods of economic growth, the number of openings (grey) and hires (red) increases. When the growth of the economy slows as it did in 2001 and 2008 there is a decline in the number of openings and hires. At present both openings and hires are trending upwards. • Other Separations – retirements; transfers to other locations; deaths; or separations due to employee disability. • Quits – Employees who leave a company voluntarily. • Layoffs and Discharges – Involuntary separations initiated by the employer. 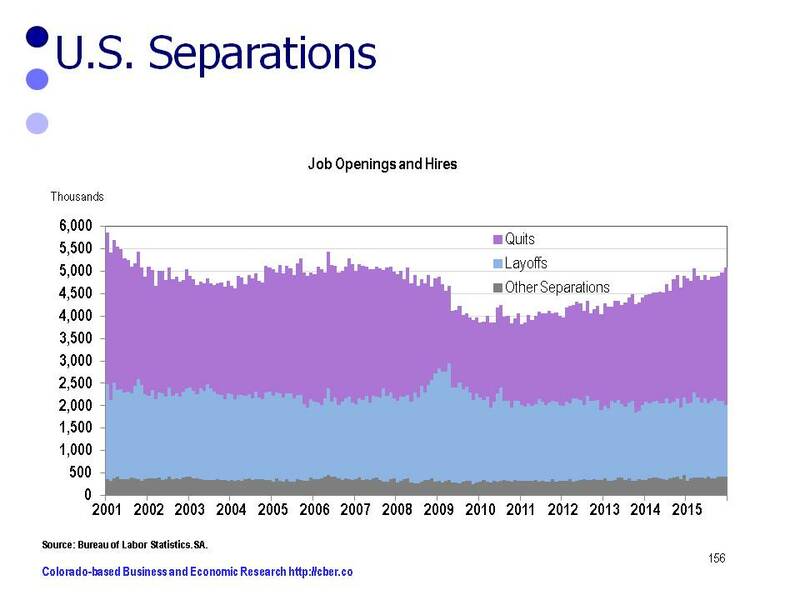 Currently, other separations (grey) are flat, layoffs (blue) and discharges are flat or trending downward, and quits (purple) are increasing. These are indicators of a healthy economy. As mentioned earlier, the number of hires moves in conjunction with the performance of the economy. During 2008 and 2009 the number of hires declined sharply. At the same time, the number of separations (grey) declined at a much slower rate, i.e. the number of layoffs increased significantly. The result is the massive job losses associated with the Great Recession. 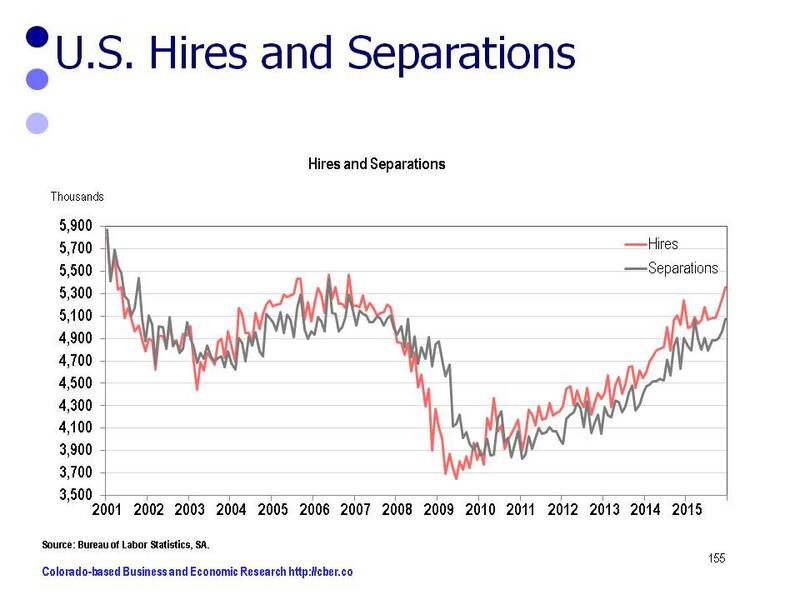 Since 2010, both hires and separations have trended upwards. As there are more job hires, more people quit their jobs to take positions with other companies. The bottom line – the U.S. job market appears to be on solid footing for the moment. On February 7, Super Bowl 50 will feature the Panthers vs. Broncos. Without a doubt, most Coloradans think the outcome of the game is a foregone conclusion. Some fans have painted their houses and dyed their hair orange and blue because they know the Broncos will win. One of the fun parts about the hype of Super Bowls is the statistics associated with the big game. For example, CBS Sports has reported that on Super Bowl Sunday fans will drink 325.5 million gallons of beer and eat 1.25 billion chicken wings. Really? From an economic perspective how do the city of Charlotte and Denver match up? The following table includes economic data from the Bureau of Census Quickfacts (2/14/2016) comparing the city of Denver and Charlotte. Charlotte is the larger of the two cities, but recently Denver has grown at a slightly faster pace. Housing and rent are less expensive in Charlotte and the city has a higher owner-occupied housing rate. Charlotte has a higher percentage of high school degrees, but Denver wins the battle for bachelor’s degrees. Charlotte has a higher median household income, but Denver has a higher per capita income. Charlotte has a higher percentage of people without health insurance, but Denver has a higher rate of persons in poverty. Both are prosperous cities. Panthers vs. Bronocs. Game on! Today, BLS released December unemployment and employment data for Colorado. The seasonally adjusted unemployment rate for the state dropped to 3.5%. This is significantly lower than the U.S. rate of 5.0%. Workers will benefit from lower unemployment rates, but lower rates are generally bad for businesses. In many cases companies are not able to fill critical positions. In turn they are forced to hire unqualified workers, pay overtime, or leave money on the table. Nationally, 25 states posted declines in their December unemployment rates compared to November. There were increases in 14 states and no change in the rates for 11 states and the District of Columbia. BLS reported lackluster nonfarm job growth in Colorado in December. This level of growth is in line with the pattern for U.S. seasonally adjusted nonfarm job growth. On a seasonally adjusted basis there were 10,700 more workers in December than November. To that point, there was strong growth across the country. Nonfarm payroll employment increased in 36 states and the District of Columbia and it decreased in 14 states. Looking at U.S. job growth on a quarterly basis there was weak employment growth in Q3, but strong growth in Q4. Given this trend nationally, it stands to reason that Colorado is following that same pattern. The data is in line with the level of activity on the streets. The data indicates that Colorado added about 20,000 jobs in Q4, after no job growth in Q3. On March 14th BLS will release its employment benchmark data for 2015. That data will more accurately tell the story of 2015 nonfarm job growth in Colorado. The primary focus of most state economic forecasts is to project total state employment. Over the years cber.co has worked on various Colorado economic forecasts – some were multi-year projections, others were one-year annual totals, and some projected sector totals that were added to derive the state total. The latter approach introduced numerous variables for error. cber.co feels the most accurate forecast is achieved by projecting total employment based on projections for three categories of sectors. Sectors are grouped into three categories based on their past performance. Projections for the categories and overall employment are based on trends, feedback from business leaders, economic developers, and other economists. The sum of these categories is then used to estimate overall total employment. Minor adjustments are made and final forecasts are produced for three scenarios. The most likely scenario is used as the final cber.co forecast. This final step helps create a better understanding of upside and downside risk associated with the forecast. This portfolio approach has made it easy to see that some sectors consistently create jobs at a higher rate of growth, some show solid growth, and others are more volatile. Ultimately, the volatile category tends to have a greater influence on the change in total job growth than the sectors with steady growth. The most difficult challenge in producing the 2016 forecast was to estimate the 2015 data. The methodology used by BLS to produce the preliminary nonfarm data was flawed. 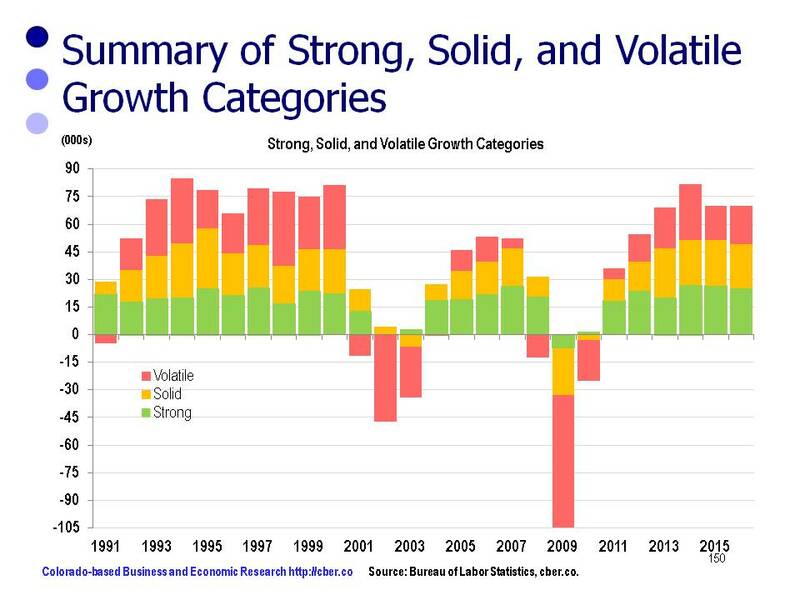 Having said that, the growth of the Strong, Solid, and Volatile Growth Categories will be similar to 2015; however, the total will be slightly less. The 2016 projected rate of growth will be 2.9% to 3.2%, similar to the last two years. The 2016 projected rate of growth will be 2.3% to 2.5%, similar to the past two years. • 2016 20,000 to 22,000. The 2016 projected rate of growth will be 2.7% to 3.0%, similar to 2015. The 2016 cber.co Colorado economic forecast portends the state will add 67,000 to 73,000 workers and job growth will be 2.7% to 2.9%. For additional information about the 2016 cber.co Colorado Economic Forecast click here. Each year the forecast provides an optimistic, pessimistic, and most likely scenario. • U.S. Real GDP growth will be greater than 2.6%. • Colorado will add more than 73,000 workers, the rate of job growth will be greater than 2.9%. The projected likelihood of this scenario is 18%. The Colorado economy has experienced solid job growth since 2012; however, given the slowdown in the global economy and the lower price of oil, it is unlikely the state will experience accelerated growth. • U.S. Real GDP growth will be less than 2.3%. • Less that 67,000 Colorado workers. Job growth will be less than 2.7%. The projected likelihood of this scenario is 22%. While the global and U.S. economies are expected to see slight growth in output, the Colorado economy could be derailed if the price of oil stays low and the global economy slows further. • U.S. Real GDP will be 2.3% to 2.7%. • The U.S. will add at least 2.7 million workers. • Colorado will add 1.8% of total U.S. jobs added. • Colorado will add 67,000 to 73,000 workers, job growth will be 2.7% to 2.9%. Despite downside risks there is a 55% likelihood this forecast will occur. Since 2012 growth has been steady and broad-based. Much of the growth has been in sectors such as tourism, which have an indirect link to the extractive industries. 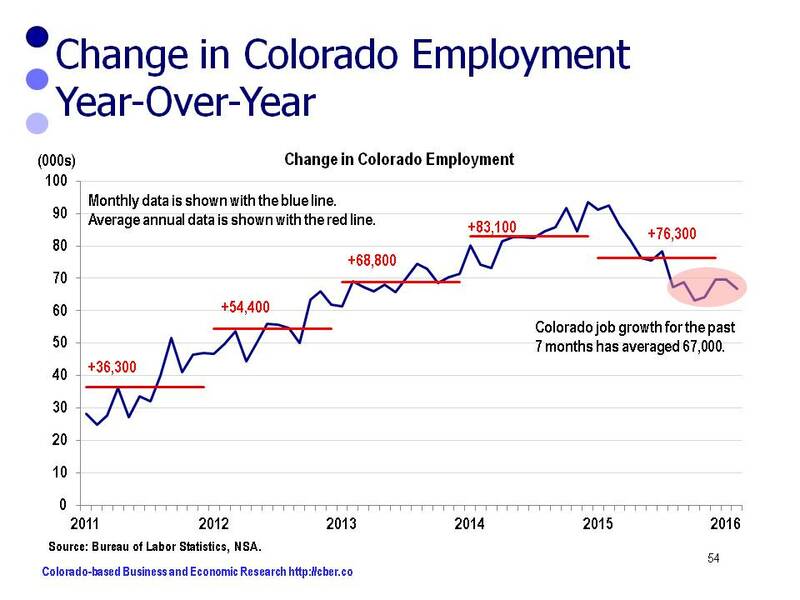 The bottom line – look for continued job growth in Colorado, but at a slower rate than 2015.